With out the efforts of Saint Paul Christianity today would have ended up just like an another sect of Judaism confined only to a small state something like Israel. If not for the charismatic envision of Paul and his acquaintance with the Gentiles, in fully understanding the mindsets of the Gentiles, in clearly knowing what they like and what they don't, I'm afraid with out Paul it would have been impossible for the other apostles of Jesus to gain Gentile converts. 1. Gentile converts need not have to follow the Laws of the Old Testament. No Gentile would have converted to Christianity if Christians had enforced strict Jewish Laws on the Gentile souls because the whole concept of a divine law which human beings have to strictly follow to avoid a God's wrath was an alien concept to them and they would have never liked it at all. 2. Gentile converts need not have to undergo circumcision. If the Jewish Christians just like Saint Peter had insisted that even Gentiles must undergo circumcision in order to become Christians I am sure Gentiles would have distanced themselves from Christianity. Every Gentiles eyes and ears would have lit up when Paul says this in Corinthians because Gentiles loved apocalyptic literature and ascension to various heavens. 4. Christianity as a mystery religion. Gentiles loved those religions having a mystery surrounding them and many Gentiles of that time were initiated into Dionysian, Orphic, Eleusinian, Osiris and Mithraic mysteries. Paul by transforming the human Jesus into a heavenly father preached his Gospel with a salvation theme similar to the mystery religions and guess what Gentiles loved his Gospel more than anything else. 5. Jesus as the first born God. No Gentile would have worshiped a human as God or in other words no Gentile would have worshiped Jesus if he was just a human being without giving salvation to the Gentiles in return no matter how divine his parables were or no matter what miracles he made. Paul very well knew this hence he established Jesus as the first born God just as the pagan sun god Helios-Mithras. One can see that in all the five points which led to the success of Christianity Paul's influence is punched on every one of them. This is one of the yogic powers mentioned in the Yoga Sutras of Patanjali. Atheists will continue to be skeptical about the existence of the supernatural despite numerous empirical evidences like this and they will convert to theism once they experience the supernatural all by themselves. Even Saint Teresa of Avila was lifted from the ground. By Valentin de Boulogne - Blaffer Foundation Collection, Houston, TX. Saint Paul was never really a part of the orthodox church. According to the Apostolic creed of the Catholics the doctrine of the resurrection of the flesh is very important to their belief in Christ. "I believe in . . . the forgiveness of sins, the resurrection of the flesh. Amen" (Old Roman Symbol [A.D. 125]). But did Saint Paul ever believed in the resurrection of the flesh? No, he did not as these below verses show. "For what the law could not do, in that it was weak through the flesh, God did: sending His own Son in the likeness of sinful flesh, and for sin, condemned sin in the flesh." "Now I say this, brethren, that flesh and blood cannot inherit the kingdom of God; nor does the perishable inherit the imperishable." Which agrees with the view in the Gospel of Philip. "Those who say they will die first and then rise are in error. If they do not first receive the resurrection while they live, when they die they will receive nothing." Paul did not believed in bodily resurrection instead he believed only in spiritual resurrection. If the resurrection of the flesh was so important to the Catholics and if Saint Paul vehemently opposed such a doctrine how could Saint Paul be the first pope and the leader of the Catholic Church? The truth is that he was never ever a part of the orthodox church. Paul, the self hating Jew also hated the doctrine of the resurrection of the flesh espoused by the three pillars of the church at Jerusalem who were Jesus brother James, Peter and John who did not fully comprehend the message of the Saviour. Paul had a gospel of his own and the zealot pneumatic Charismatic Paul never once compromised on the doctrines of his Gospel because he received his knowledge not from any man or from an another God or angel or from an another mystery cult but he received his knowledge directly from the Christ with in. After the death of Saint Paul, his arch-enemies who were members of the Catholic church who claimed themselves to be true Christians hijacked his mission and silenced his polemic against them by carefully manipulating his letters and by forging in his name produced one of the vast cover up in human history. Anyone who did not agreed to the imbecile Catholics ended up as Gnostics. Finally they dragged him and submerged him into their own cult giving a false impression to the world as though there was no schism inside Christianity. A new false history emerged with a syncretism of Pauline and Peterine theology and the main mission which Paul passionately preached, stood and died for ended with the mass persecution of the Gnostics in the name of the Catholic Inquisition. 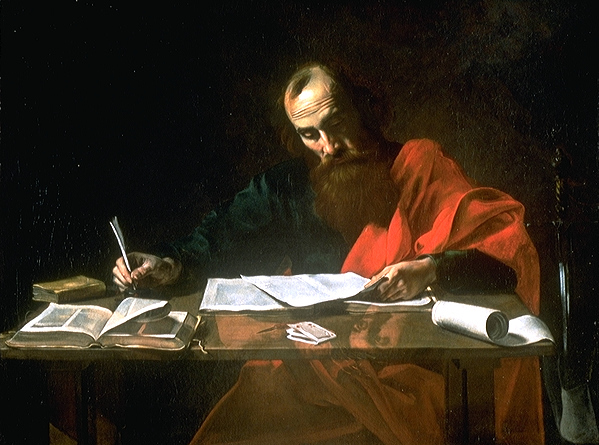 The time has come to separate Saint Paul from the Catholic Church and to reignite a new hope to his pneumatic mission to the Gentiles and to finally spread the true Gospel of the only true Apostle, Saint Paul of Tarsus. No wonder Marcian of Sinope long figured out this truth and split himself up from the false church of the Catholics.